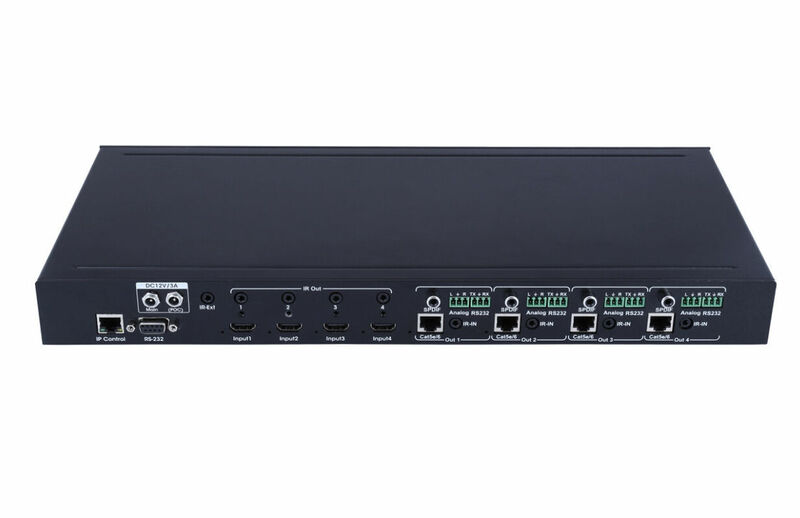 This 4K resolution HDMI matrix with UTP Extender is a 4-by-4 DVI/HDMI true matrix. It allows any source (Blue-Ray player, HD DVD player, satellite receiver, game system, etc.) to be shown on the any of the four displays simultaneously, no matter the source is HDCP or not. Extra infrared receiver extension, IR emitter, RS232 and Ethernet port are supplied for remote control. HDMI matrix has the ability of equalization and amplification to ensure HDMI signal's transmission through long cable without quality loss.This HDMI matrix offers solutions for digital entertainment center, HDTV retail and show site, HDTV, STB, DVD and projector factory, noise, space and security concerns, data center control, information distribution, conference room presentation, school and corporate training environments. 1). 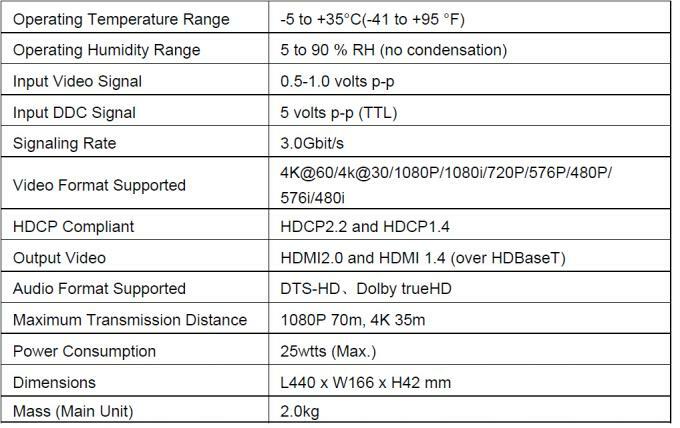 HDMI 2.0 version (Support HDMI2.0 4K50/60Hz YUV4:2:0). 2). Support high definition resolutions 4K@60, 4K@30, 1080P, 1080i, 720P and standard video format. 3). 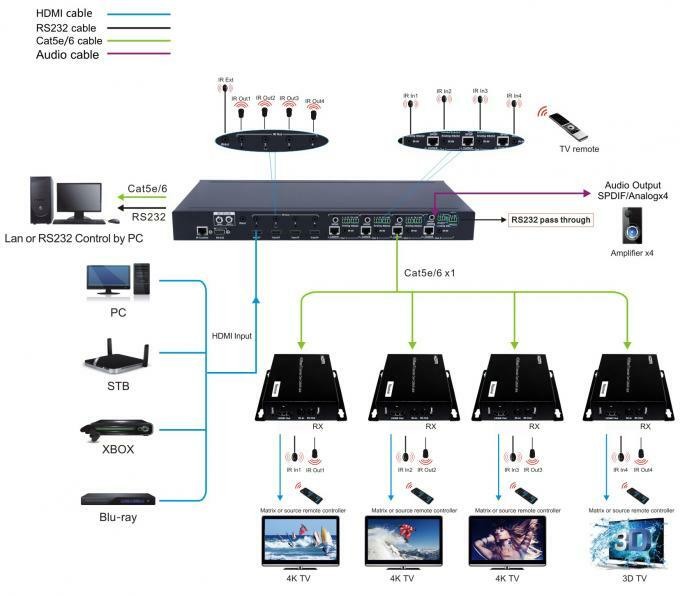 Transmit up to 70m under 1080p, 35m under 4K@30Hz. 5). 4 HDMI input ports, 4 HDBaseT output ports. 6). Any one of the 4 sources to any one of the 4 Displays. IR extension from Sender to Receiver or from Receiver to Sender. 8). Support Panel Button, IR Routing, RS232 Control, IP Control Via Telnet. 9). POC (Receiver powered by HDBaseT Matrix). 10). 1U rack design, easy installment.